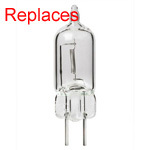 Pin type LEDs replace glass halogen bulbs. They run much cooler, yet product even more light. A quality product with full 10-30v circuitry. Check individual specifications for dimmability. Most are dimmable with a dimmer in good condition, and all are dimmable with one of our LED dimmers.